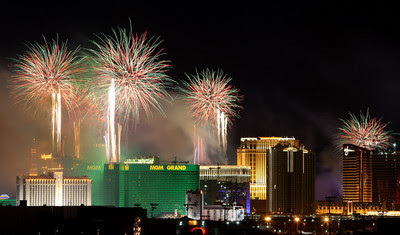 Las Vegas celebrates the New Year with a huge display of fireworks. Seen from all over the valley, choreographed fireworks were launched from several of the casinos on the Las Vegas Strip. News stations covered the event on TV complete with music. In fact, the whole night was covered. Parties all up and down Las Vegas Blvd hosted thousands. As many as 300,000 people participated downtown. From the Freemont Experience to Mandalay Bay the noise of celebrating visitors and locals could be heard. The weather was great and droves of people had a great time. It was an exciting night.